To be two-faced is human nature. To laugh, to cry; to show a public face, and hide a private side; to have in all our lives aspects of comedy and tragedy to varying degrees. I suspect that this is the key to Jim Cartwright's formulation of his play, TWO, as a two-hander. There are 14 characters in total - a pub landlord and landlady with a tragic secret, about to close their pub after many years of trade; a young boy looking for his dad; a mistress confronting her married lover; an ageing widower inclined to navel-gazing through the bottom of a glass; an older woman getting the shopping in; and a variety of couples, including one in an abusive relationship and another with a shared childlike enthusiasm for Elvis and B-movie extras - and they are all played by just two actors. This conveys the message that human emotion is universal, even though the circumstances that give rise to it may not be the kind that you personally identify with. That all the characters meet in a pub over the course of a day is appropriate; it is, after all, the kind of place where you eventually reveal more of yourself to others than you'd like over a pint. It is for good reason, then, that the number two - and the related terms 'double', 'dual' and 'twice' - weigh heavily in this piece. Two-hander aside, the drama is in two parts, with a two-hour duration. Sometimes the actors double up, sometimes they don't, and rather disconcertingly, weave in and out of a two-way discourse with us - the audience - and each other, thus giving us the unusual privilege of being both participant and spectator. It's an ingenuous way of getting us all emotionally involved, which is what good theatre should be about. 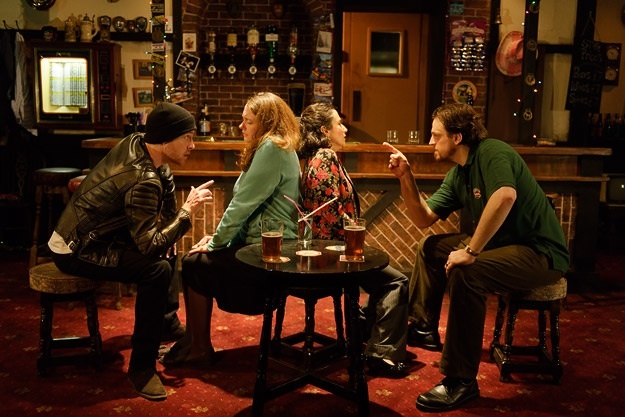 For their own production of TWO - which ended its run at Southwark Playhouse last November - Deafinitely Theatre's take was to double the number of actors to four: two speaking, two using BSL, and to have both couples almost mirror each other in the shifting role-play. I said 'almost'. Each of the four actors brought to TWO an individual style and delivery all of their own - which was a blessing, for it enabled them to focus on fleshing out each of the characters assigned to them, thus producing a true feast for the eyes. Ultimately, rather than two sets of stilted performers more concerned with synchronising each other's movements, we got a doubly emotionally-charged performance where in the end, the only timing that mattered was the delivery of their lines. RADA-trained Sophie Stone gave a classy speaking turn, while her BSL-using counterpart Paula Garfield was grittier, more raw in her portrayal. Meanwhile with his terrier-like verbal and physical energy, Jim Fish was a wonderful foil to Matthew Gurney's looming big-man presence. That said, the involvement of two languages reinforced the challenge of presenting the play in an accessible way without diluting the emotions being conveyed. Speaker and signer were built into the production as equals. Nevertheless I sensed a temptation by the BSL users to jump into action once the speakers opened their mouths, which could have affected the calibre of their performances - but crucially, didn't. As a bilingual Deaf CI user with public-speaking experience, I can ascertain that this took enormous skill on the part of the BSL actors, knowing how much easier it is to sign at your own pace when giving a presentation and let the interpreter follow you with his or her voice-over, rather than vice versa. In one scene, Lesley (played simultaneously by Stone and Garfield) is confronted about her supposed infidelity by Roy (Fish and Gurney). The speakers sat to the left of the stage, the BSL users to the right, the two women sitting back-to-back on a shared stool, faces turned away towards their partners. You could sense the simmering undercurrent of brutality as Roy manipulated Lesley every time she tried to react to his accusations, ensuring she was never able to get her plea of innocence across. The sight of two men simultaneously, psychologically abusing their female partners on stage certainly had twice the grip-the-edge-of-our-seats factor, and the tears I saw rolling down Garfield's cheeks, while Gurney jabbed a finger within close spitting distance of her, were scarily real. Many other moments in the play are vividly etched on my brain. The sight of Fish as a frightened eight-year-old boy - cute R2-D2 backpack enticing us to laugh - crying for his dad, while Garfield's landlady struggled to communicate orally with him; Stone's mistress, elegantly dressed in pussycat frills and spike heels, expressing her frustrated jealousy to her invisible paramour; the final, heart-wrenching scene between the pub landlord and landlady that once and for all prised out the tragic secret that blighted their marriage: the unacknowledged early death of a child. Combine all those moments, throw bilingualism into the mix - and you get a production that positively explodes with duality, reminding you again and again that what you see in public is never the whole story.